Ace’s original “Budokan” Les Paul made its stage debut in 1977 during KISS’s Rock and Roll Over world tour, which helped establish KISS as the #1 live act on the planet. Ace made the “Budokan” Les Paul his main axe at the very time KISS’s fame was exploding around the world thanks to prime-time television appearances, a sold-out debut at Madison Square Garden and the release of their classic album, Love Gun, which included Ace’s signature hit, “Shock Me,” which ranked #50 in Guitar World’s 100 Greatest Guitar Solos. But 1977 is most remembered as the year KISS sold out four nights at the Budokan arena in Tokyo, Japan, breaking the record previously held by The Beatles since 1966. Ace returned to Japan with his “Budokan” Les Paul the following year for the Alive II tour where KISS broke the record again with a sold out five-night stand. KISS’s Budokan appearances helped make Ace’s “Budokan” Les Paul Custom his trademark guitar. Now, Epiphone’s signature luthiers who helped create collectable artist models for Slash, Tak Matsumoto and Joe Bonamassa, present perhaps the most talked about signature model yet, the Epiphone Limited Edition Ace Frehley “Budokan” Les Paul Custom Outfit. Epiphone worked closely with Ace and his original “Budokan” Les Paul to create a faithful reproduction of his favorite Les Paul, including a period correct 3-piece hard maple top, 3-piece mahogany neck with volute, Grover® tuners with pearloid buttons, and the famous “Eagle” sticker. Unlike Ace’s original, however, all three humbuckers on Epiphone’s Ltd. Edition “Budokan” Les Paul are wired and ready to go. We’ll leave the explosive power all to you! Includes Custom hard case with “Budokan” in white stencil, numbered certificate (1 or 1,000, etc.) photo of Ace with Epiphone Limited Edition Ace Frehley “Budokan” Les Paul Custom Outfit, all presentation binder along with “Eagle” sticker unattached. The Ltd. Edition “Budokan” features a mahogany body with the same classic lines of the original with Les Paul Custom-style 7-ply white and black binding on both the top and back. And like Ace’s original, the Epiphone Ltd. Edition “Budokan” is made with a 3-piece hard maple cap. We’ve also stayed true to the Kalamazoo factory’s ’70s-era 3-piece mahogany neck with a SlimTaperTM “C” profile and a volute at the zero fret. The neck is glued-in and hand set with a deep-set neck joint. The 24.75” scale length is also exact to the original’s specifications. The bound ebony fingerboard has 22 medium jumbo frets, a 12” radius and a 1.68” bone-style nut. 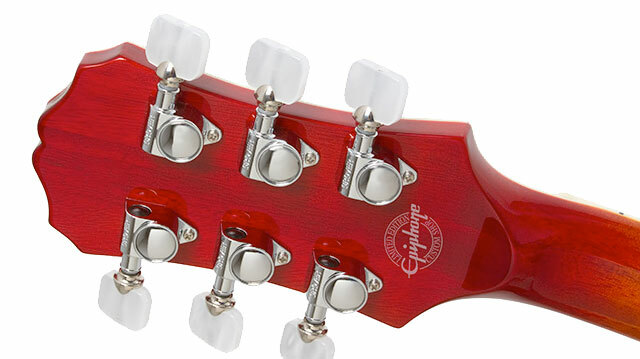 The beautiful faded Cherry Sunburst color finish will make you think you’ve found a vintage classic. And, we’ve also included an exact replica of Ace’s “Eagle” sticker that you can attach if you want to be just like Ace! The Ltd. Edition “Budokan” Les Paul Custom also 5-ply white/black binding on the headstock. The Epiphone Ltd. Edition “Budokan” Les Paul also features the same inlay found on Ace’s vintage “Budokan” Les Paul with the classic pearloid LP Custom split diamond inlay on the headstock, pearloid LP Custom blocks on frets 1, 3, 5, 7, 9, 12, 15, 17, 19 and 21 and to top it all off, a pearloid Epiphone logo on our classic clipped dovewing headstock. The iconic bell-shaped truss rod cover found on all Les Pauls has “Ace Frehley Budokan” printed in white silkscreen. As you would expect, Epiphone and Ace took great care to recreate the power of Ace’s original Budokan Les Paul. 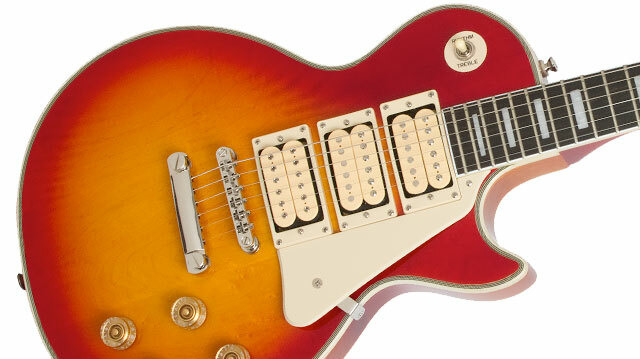 Though Ace’s original had only the bridge pickup connected, the Epiphone Ltd. Ace Frehley “Budokan” Les Paul Custom is all wired up and ready to rock with three DiMarzio™ pickups; a DiMarzio™ PAF style humbucker in the neck and middle positions and a DiMarzio™ “Super Distortion” humbucker in the bridge position to draw out the stage rattling tone of the mahogany body. We’ve also recreated the “Budokan” vintage controls featuring gold SpeedKnob™ controls for bridge/middle volume, bridge/middle tone, neck volume, and neck tone. Epiphone’s solid hardware is built to last a lifetime and the Ltd. Edition “Budokan” features our very best including Epiphone’s LockTone™ Tune-o-matic bridge, a LockTone™ Stopbar tailpiece, Epiphone’s exclusive non-rotating heavy duty output jack, and an Epiphone all-metal 3-waypickup selector. And like Ace’s original, Epiphone’s Ltd. 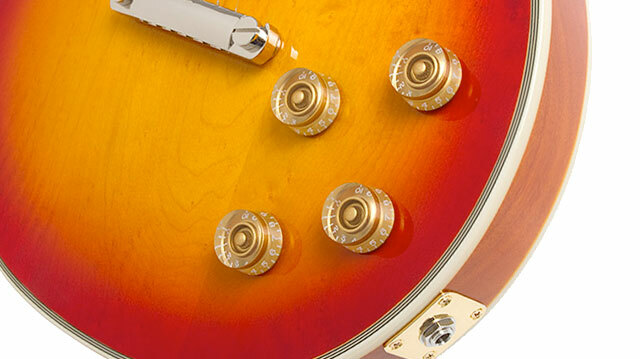 Edition “Budokan” comes with vintage-style Grover® machine heads with a 14:1 ratio and pearloid buttons. Each Epiphone Ltd. 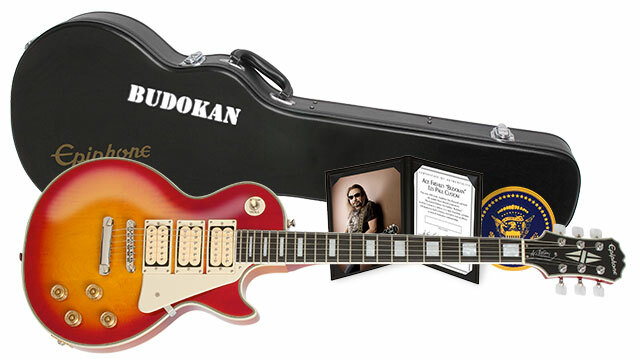 Edition Ace Frehley “Budokan” Les Paul Custom Outfit comes with a custom hard case with “Budokan” in white stencil, a numbered certificate, an unattached “Eagle” sticker, and presentation binder, which also includes a photograph of Ace with his Epiphone “Budokan” Les Paul.